Every moment is a chance to experience gratitude, even if it doesn’t feel that way. I’m still learning this lesson, and I have to keep reminding myself. But in every moment — with every breath — there’s something to be grateful for. If you really can’t think of anything else to appreciate, be thankful for another breath. And another, and another. I’ve always been a goal-setter. I used to make New Year’s resolutions, but like most people I made myself promises I could barely keep for the first day of the year, alone for 365 of them. Then I started setting yearly goals, and soon wised up and allowed myself the latitude to revisit those goals every quarter, every month — every day, even. It’s not that I don’t stick to my goals. In fact, many of them carry over year after year because they’re worthy goals. But you have to give yourself permission to refine, relax or replace those goals with something that works better. Lately, the yearly practice I gravitate to the most is keeping a gratitude jar. All it takes is an empty jar, some notepaper and a pen, and the willingness to pause and write down something you’re grateful for. After seeing the idea on a friend’s Facebook page, I filled my first jar in 2015. I’ve been doing it ever since, and just dropped the first note of gratitude into the jar for 2018. There’s something enormously satisfying about watching a jar fill up with your thankfulness over a year. 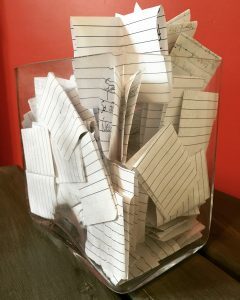 The beauty of a gratitude jar is that you don’t have to write much. It’s just a scrap of paper. I don’t force myself to write every day, but I scribble something when the urge strikes me. Maybe I feel a surge of gratitude or appreciation. Or maybe something meaningful happens and I take a moment to note it, along with the date, and to feel thankful. There are also days when I feel like there’s nothing to be grateful for, and I make myself find something — anything — to appreciate. It doesn’t ever take me long to come up with something. The sight of the jar filling up reminds me to feel grateful, and motivates me to find more reasons to make that jar overflow (remember: I’m goal-oriented). Then at the end of each year, I go through all the slips of paper one by one, reliving the year’s moments of gratitude — jumbled and out of order, but almost more meaningful that way because those moments add up to a whole that isn’t bound by time and space. Sure, the notes evolve as my life does, but with hindsight it’s the sum total that really resonates with me. The many little reasons for gratitude really add up. In talking with others who practice gratitude regularly — or who want to — one central concept is consistent: Taking a moment to experience gratitude cultivates more gratitude. The more grateful you feel, the more reasons you’ll find to be grateful. I know it’s unlikely that I’ll be consistent enough to drop a note in my gratitude jar every day this year. After all, I have decades worth of journals with only the first few pages filled in before they were abandoned. But maybe this year I’ll try adding one note to the jar each day. Because the days when feeling grateful seems impossible are the days when gratitude is needed the most.